A fine singer illuminates the many surprising facets of Bob Dylan. Joan Osborne isn’t exactly glamorous, just damn good. She’s a shoot-from-the-hip vocalist with a rich well of emotion to draw from. There’s a reason she’s having such a great career: her voice is rich and her interpretations of songs are honest and moving. 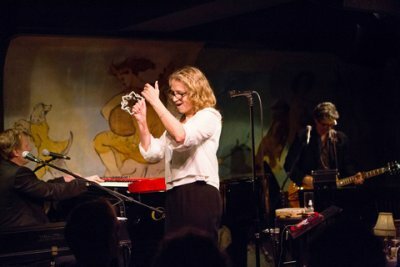 At the Café Carlyle, she is turning her talents to a program of the Songs of Bob Dylan, enchanting the generally conservative audience with Dylan’s incredible range. She was immeasurably helped by Keith Cotton on keyboards and Jack Petruzzelli on guitar. Both also served as back-up vocalists, pushing and pulling her along with humor and great musicianship. Most people have difficulty imagining Bob Dylan as anything but the down-and-out troubadour singing for his supper in Greenwich Village nightspots in the early Sixties. He is, in fact, an incredibly prolific, sophisticated writer and Ms. Osborne slid easily from his country/western tinged ballads (“Tonight I’ll be Staying Here with You”) to his scathing, but clear-eyed philosophy of the world (“Gotta Serve Somebody”) to his tender love songs (“Forever Young”) and on to his Christian evangelical period (“Saved”). Mr. Petruzzelli’s long guitar solo took “Love Sick” to an almost meditative height while Mr. Cotton’s organ-like solo on the solemn “Make You Feel My Love” helped Ms. Osborne find just the right colors for what was actually a sweet love song. This was a rewarding evening that brought together topnotch singing and musicianship performing the works of a major, influential creative artist who changed the world as he commented on it. 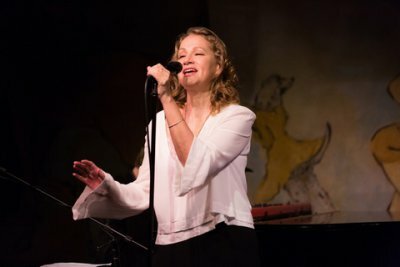 Joan Osborne has the perfect instrument and instincts for Dylan’s work, making her show at the Café Carlyle more than just a chic night out, but a rewardingly satisfying experience. The English singer takes you back in time to the hit parade of yesteryear to listen anew to the folk and pop songs of the 1960's. William Finn’s songs are given the first class treatment. Maverick theater director's textually faithful reimagining of Ingmar Bergman's classic film can be viewed as a travesty or as profound. Larry Mollin’s play about the life of one of Bob Dylan’s first musical mentors will entertain you with an evening full of classic folk songs and a little known story of a man who became his own demise as he watched his friend rise to fame.